what is “flash” pulmonary edema? “Flashing” is a sign of acutely elevated cardiac filling pressures. It must be treated urgently. The next question you should ask yourself is, “Why is my patient flashing?” Consider acute CHF exacerbation, ischemia (MI), acute mitral or severe aortic regurgitation, or arrhythmia like afib. Hypertension can be an exacerbator of pulmonary edema because it creates diastolic dysfunction. Patients with severe renal disease are in a constantly fluid-overloaded state, so it’s not hard to push them over into pulmonary edema. 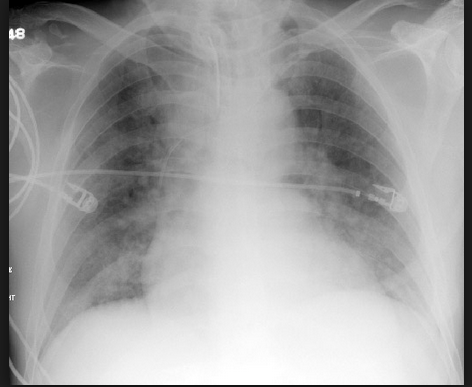 How do you treat flash pulmonary edema? The first step is high doses of IV lasix. If the patient is lasix-naive you can start with 20 mg IV lasix, but more often, patients will require 80 to 120 mg IV lasix. Ely EW, et al. Effect on the duration of mechanical ventilation of identifying patients capable of breathing spontaneously. N Engl J Med 1996;335:1864-9. Question: There are no hard and fast rules about when to extubate patients. Could screening them daily with certain criteria lead to earlier and more appropriate extubations? No infusions of vasopressor agents or sedatives could be used (dopamine could be given in doses not exceeding 5 μg per kilogram of body weight per minute, and intermittent dosing of sedatives was allowed). If the patient did not tolerate the trial, they were re-intubated and the whole process was repeated on subsequent days. The intervention group that got screenings was given an SBT, on average, 1 day earlier than the control group and was ventilated for 4.5 days (p=0.003), compared to the control group, which was ventilated for a median of 6 days. The intervention group also had fewer complications than the controls (p=0.001) including fewer reintubations and ventilation >21 days. There were no significant differences between groups in the number of days of intensive care or overall hospitalization, although cost of care for the intervention group was lower (p<0.04). Our observations also underscore the key role of nonphysician health professionals in providing safe, efficient ventilatory care. During the study, the commitment of time by physicians appeared minimal, since most monitoring was done by respiratory therapists and nurses as part of their standard patient care. Bottom line: This RCT shows that daily screening and SBT can reduce the number of days that a patient is mechanically ventilated for, and leads to earlier and more appropriate extubation, fewer medical complications, and a less costly hospital stay. ARDSNet. Ventilation with lower tidal volumes as compared with traditional tidal volumes for acute lung injury and the acute respiratory distress syndrome. N Engl J Med 2000;342:1301-8. Question: There is evidence that “stretch” in the lungs caused by high pressure can damage lung epithelium and increase inflammation. In ventilated patients who develop ARDS or acute lung injury, will reducing tidal volumes–which had been avoided because of worry of respiratory acidosis–improve their clinical outcome? 861 patients with acute lung injury and acute respiratory distress syndrome were randomly assigned to a conventional tidal volume arm (beginning with 12 ml per kilogram of predicted body weight to reach a plateau pressure 50 mm H2O) or a low tidal volume arm (beginning with 6 ml per kilogram of predicted body weight to reach a plateau pressure 30 mm H2O). The trial was actually stopped early because significant benefits were found for the low-volume group. Mortality was 22% lower in the low-volume group (31.0%) compared to the conventional tidal volume group (39.8%, p=0.007). Circulatory failure, renal failure, and coagulation failure rates were also lower in the low-volume group. The low-volume group also had more ventilator-free days. It should be pointed out that ventilation is a dynamic process and there were other variables that the authors adjusted that helped the low-volume group. The low-volume group required a slightly higher PEEP setting (around 9 as opposed to 8 cm H2O). The low-volume group was also allowed to get bicarbonate for correction of acidosis. Furthermore, the low-volume group did have a very slightly lower arterial oxygenation level compared to the traditional-volume group–but it doesn’t appear to have been clinically significant. Interestingly, barotrauma rates remained the same, which the authors pointed out seemed to be independent of airway pressures. Bottom line: While every patient’s clinical scenario is going to be different, because of this paper, most patients on mechanical ventilation are started at a tidal volume of 6-8 ml/kg. What’s the difference between CPAP and BiPAP? As with many confusing devices, it’s best if you can look at the actual devices and compare them. Also, don’t think too hard about it. It’ll just make things more confusing! Both of these devices provide oxygen with extra oomph (the scientific term would be “pressure”). CPAP has one continuous pressure setting, so will, for example, always provide 10 mm H2O pressure. 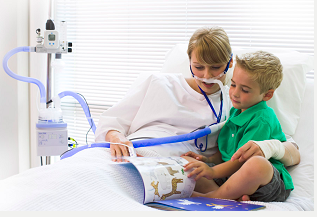 BiPap can provide different levels of pressure depending on the inspiratory/expiratory phase. NEVER give Bipap to someone who needs to be intubated, because Bipap is an UNSECURED airway! How much oxygen should you give a patient? Frequently you see in patient reports that he/she was “on 2L by nasal cannula” or “20 L on high flow O2.” What does this mean and how the hell are you supposed to know how much O2 to put your patient on? oxygenation %. Are you giving them a gas that is 50% oxygen or 100% oxygen? That will affect how much, quantity-wise, you want to give them. liter flow. Are you giving them 2 L just because everyone else is on 2 L, on blasting them with 40 L because you just really don’t want to intubate them? Patient comfort. Does the nasal cannula make their nose bleed? Do they keep struggling to take the mask off, but are content with a face tent? If your patient hates whatever contraption you use to administer oxygen, you probably won’t succeed. The simplest thing to pop into someone’s nose. If you’re using the oxygen tank on the wall, the FiO2=100%. However, you are thwarted by the always imperfect, mixed O2 content that actually gets up a patient’s nose, mouth breathers, people who wiggle out of them, patients with a low respiratory rate, nasal obstruction, etc. Go up to 6 L before considering another device. If a patient gets cracked or bleeding nares, use vaseline! Masks can be more comfortable than having two little sticks poking up a patient’s nose. The simple face mask is pretty self-explanatory. 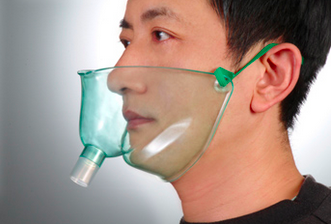 The Venturi=Venti mask. It provides mixed O2 usually around 50%, and ranges up to 8 LPM. 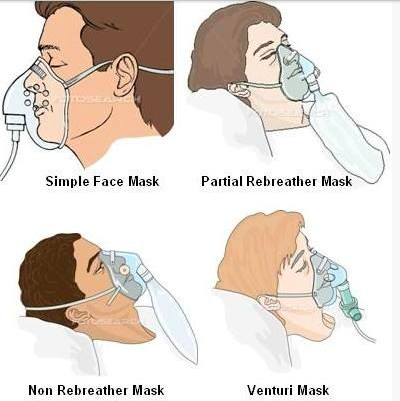 My MICU fellow summarized the Venti mask: “What is this thing really doing, even?” Because it provides reservoir O2, the O2 sat% looks better, but but the patient might as well just be sitting on a half-hanging out nasal cannula. The partial rebreather is a mask that has a bag attached to it. 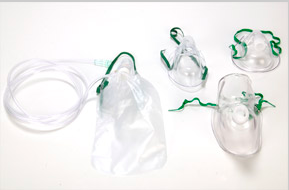 The bag contains a reservoir of O2 that can be pumped in at 10-15 LPM.One-way valves trap their expired air in the mask and allows about 2/3 of it to escape. Yes, this means that the patient “re-breathes” some of his/her own air. Why??? Because the respiratory drive is stimulated by the rebreathing of CO2. Most patients do not look this calm on a face tent. From: besmed.comHigh-flow O2 up to 60 L/min. Why?!!! The face tent is for patients who may feel anxious with a mask or uncomfortable on a nasal cannula. As you can see, it’s pretty exposed to the outside air, and so delivers mixed O2, usually at a high flow rate. 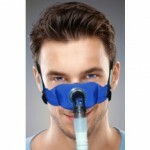 This is just another way of administering, as the name suggests, huge amounts of oxygen. It literally sounds like the patient has a hair dryer aimed at their face. 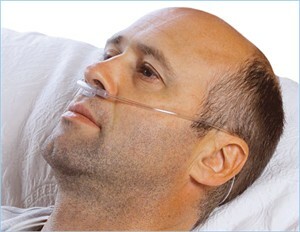 If you have a patient on high flow oxygen, really consider if there is an alternative or if intubation is impending. What are the basics of tracheostomy indications and management? I think that the most helpful literature for understanding trachs comes from the nursing literature, since nurses have to deal with daily trach care. I remember the first time I had a trached patient on the wards, and being asked what size his trach was and blankly staring back at the nurse asking me. Hopefully, with this overview, you will be able to take care of your trached patients more confidently! obstructive process such as tumors within the airway, paralyzed vocal cords, swelling, stricture, or unusual airway anatomy (tracheobronchomalacia is a common one). Do they have a cuff? Is their cannula fenestrated (allowing speech) or unfenestrated? What is the gauge (diameter/size) of the trach? When was it last changed? Suctioning: a patient needs suctioning if they have increased work of breathing, increased respiratory rate, desats, wheezing, copious secretions, or are unable to clear secretions on their own. For open-system suctioning, catheter size shouldn’t exceed half the inner diameter of the internal trach tube. To determine the appropriate-size French catheter, divide the internal trach tube size by two and multiply this number by three. A #12 French catheter is routinely used for closed suctioning. Cleaning: Clean the stoma with a gauze square or other nonfraying material moistened with normal saline solution. Start at the 12 o’clock position of the stoma and wipe toward the 3 o’clock position. Begin again with a new gauze square at 12 o’clock and clean toward 9 o’clock. To clean the lower half of the site, start at the 3 o’clock position and clean toward 6 o’clock; then wipe from 9 o’clock to 6 o’clock, using a clean moistened gauze square for each wipe. Continue this pattern on the surrounding skin and tube flange. Avoid using a hydrogen peroxide mixture unless the site is infected, as it can impair healing. At least once per shift, apply a new dressing to the stoma site to absorb secretions and insulate the skin. After applying a skin barrier, apply either a split-drain or a foam dressing. Change a wet dressing immediately. Use cotton string ties or a Velcro holder to secure the trach tube. Velcro tends to be more comfortable than ties, which may cut into the patient’s neck; also, it’s easier to apply. To avoid inadvertent dislodgement of the tracheostomy tube, one person should hold the tube in place while a second person performs the tie exchange. A patient with a newly placed trach should have their first tube changed before leaving the hospital. In general a trach should be replaced about every 2 weeks (“expert consensus”) because crap builds up on every and any type of trach within 1 month. Your contingencies for freshly trached patients overnight should include massive hemorrhage (tamponade with the cuff), trach obstruction (usually a mucus plug, secretions, or false tract) or tube falling out (intubate and don’t replace the trach). Cuff leak: The purpose of the cuff is to provide a closed system. Cuff pressure should be 20 to 25 cm H2O with most tracheostomy tubes. Underinflation promotes leakage and VAP, while overinflation may cause tracheomalacia, ulcerations, fistulas, and stenosis. benefit of the entire tidal volume.